The Inuit, Iñupiat, Kalaallit and Yupik peoples of the Arctic region of Canada, Greenland and Alaska built inukshuks with granite boulders to warn against danger, mark a hunting or fishing site, or stand as a direction marker. Like the traditional inuksuit erected in the treeless tundra, Jerusalem sculptor Israel Hadany’s modern interpretation of the First Nations beacon serves as a marker symbolizing friendship, family and hospitality, humankind’s responsibility toward one another. On Oct. 17, Hadany’s four-metre-high limestone inukshuk sculpture was installed at the entrance to Canada House in downtown Jerusalem’s Musrara neighbourhood. Hadany was the winner of a design competition celebrating 50 years of the reunification of Jerusalem, since the 1967 Six Day War. 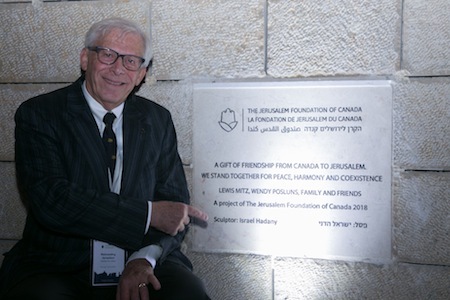 Toronto lawyer Lewis Mitz, president of the Jerusalem Foundation of Canada, initiated the challenge as part of a $4 million renovation of the Canada House community centre on Shivtei Yisrael Street, a location that is becoming increasingly popular with film and art students. Four other Israeli artists were invited to participate: David Gershoni, Ruslan Sergeev, Yisrael Rabinowitz and Ellia Shapiro. The competition jury that selected the winning design included representatives from the Jerusalem Municipality, the Israel Museum, the Jerusalem Foundation and local residents. The sculpture was dedicated during the Jerusalem Foundation’s international conference in October in the Canada House garden. The playground around the inukshuk, which is still being landscaped, was a gift of the Joffe family of Calgary, Alta. Gil Zohar is a journalist based in Jerusalem.